There’s a gap between the small sample of a single game and the relatively larger sample of a full year in fantasy football. It’s not crazy for a fluke name to lead the league in fantasy scoring over a one- or two-week sample. It’s very crazy for a complete fluke to do so over 16. That middle ground, though, is where things are interesting. Just like I did a season ago, I’m looking at the leaders at each position over every four-game stretch of the 2018 season to see if we can glean anything from the guys who led the position over small chunks of the year. One early note on this: The biggest surprise of the 2018 list is how there weren’t many surprises. Among the players who led their positions in fantasy scoring over four-game stretches of 2017 were Blake Bortles, Keelan Cole (not the same four weeks, either), Cameron Brate, and pre-Colts Eric Ebron. In 2018, though, there was only one player, maybe two, at any position took a four-week title who you would truly call random. It was the year of the big-name dominance over the full year, but it was also the year of the big-name dominance over short spurts as well. Below you can find each position’s leaders for every four-week section of the season, as well as a few highlights. 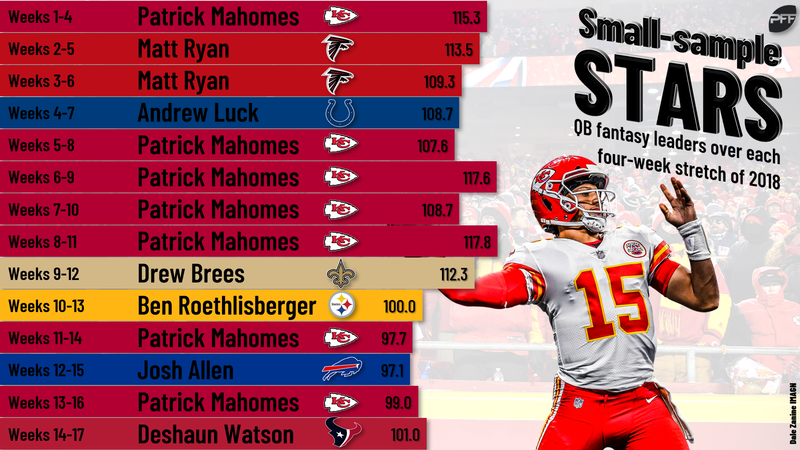 It’s no huge surprise that Patrick Mahomes had a big chunk of the leadership here; in fact, it might be a surprise that he “only” led for seven of the 14 possible four-week sections. Regardless, there isn’t much more to say about the season he just put up. So we move on. Luck came into Week 4 22nd among quarterbacks in fantasy scoring, behind Josh Allen, Alex Smith, Blake Bortles, and Joe Flacco. After missing the entire 2017 season, there was cause for concern for a quarterback averaging under 16 points per game. Four weeks later, Luck was behind only Mahomes and Matt Ryan in scoring, had an average of more than 22 points per game, and things were good again. Brees’ numbers didn’t come out of nowhere — he’s Drew Brees, after all, and was averaging more than 21 points per game through the season’s first eight weeks. But he took it to another level in Weeks 9-12, notching a 15:1 TD:INT ratio and outscoring No. 2 Ben Roethlisberger by 5 points, No. 3 Mahomes by more than 20. The downside, though, is that it basically capped off Brees’ run as a fantasy-relevant name for the season — he put up only 49.1 points in Weeks 13-17, including sitting out Week 17 and putting up fewer total points than Josh Johnson and Jeff Driskel. It was a very highs-and-lows second half for the veteran. Allen led the entire league in QB fantasy scoring over Weeks 12-15 during a stretch where he had a 50% completion percentage and a 70.1 passer rating. Obviously, he succeeded with his legs — and lest his big run get overrated, it was also the worst score for any four-week league leader at QB or RB and second-worst at WR. Allen had played six games as a rookie before the stretch started, putting up only 69.8 points over that time. He topped that by more than 33% despite 33% fewer games to work with. Yeah, he was the fluke name I was talking about above. Saquon Barkley led the league in RB fantasy scoring but didn’t lead any individual four-week span. That’s a testament to his consistency, actually, as he didn’t need any particular big stretches to end up on top. Each of the next three on the list — Christian McCaffrey (six four-week chunks), Todd Gurley (four), and Alvin Kamara (two) did lead stretches of the season, as did two other names. Hunt had a relatively slow start to the season. He had a total of 171 scrimmage yards and one total reception through three weeks, albeit with three touchdowns. After that, he had at least 86 scrimmage yards in every game he played the rest of the year, with 11 touchdowns in eight games. After this hot four-week stretch, Hunt was fifth in the league in RB fantasy scoring and tied for the position lead with six receiving touchdowns. His chances at contribution in 2019 are much lower, owing to his suspension and new role as a backup in Cleveland, but we’ve seen that he can be an elite performer with the opportunity. Henry’s rushing yardage down the stretch of the season was the best four-game rushing total all season by nearly 50 full yards. The only four-game stretch with more rushing scores was Henry’s own Week 13-16 stretch. Despite that, his total of 105.6 points was the lowest RB total to lead any four-game stretch all season. The reason for that is clear — Henry isn’t a factor in the receiving game. He finished the full season as the PPR RB16 on the backs of only 18 targets, 15 receptions, and 99 receiving yards. Sony Michel, at RB34, had the best finish of any back with fewer targets and receptions, and Peyton Barber at RB31 had the best finish of any back with fewer receiving yards. 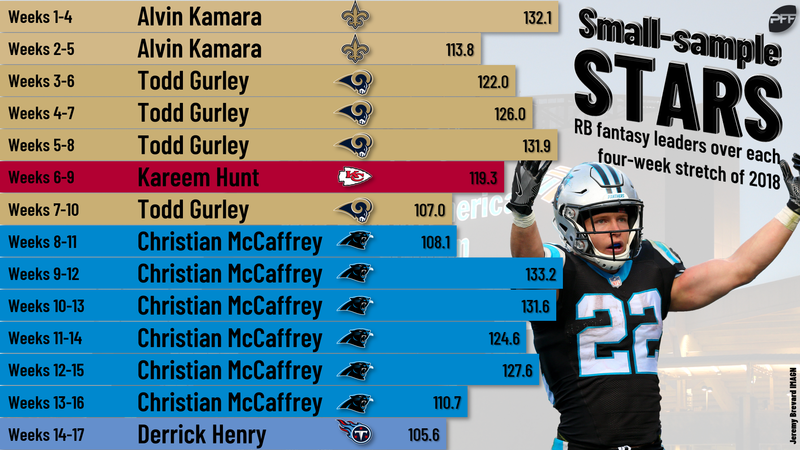 If Henry does get the lion’s share of carries in 2019, he’ll be a fantasy producer, but his ceiling is capped. 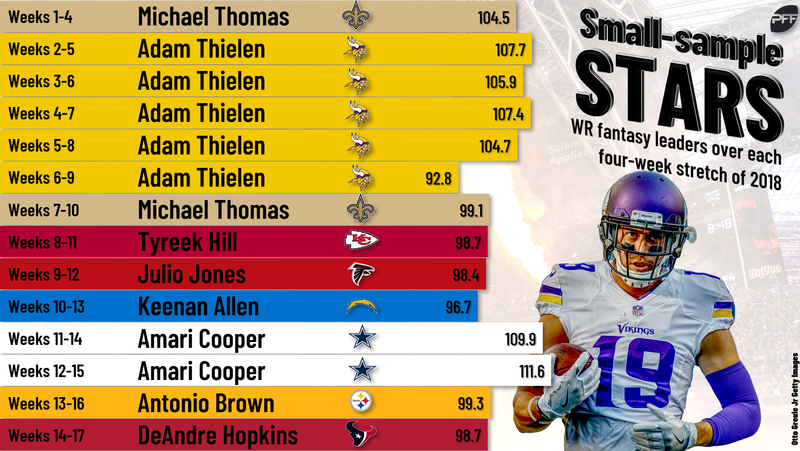 All of the season’s first seven four-week sets were led by either Michael Thomas (Weeks 1-4 and Weeks 7-10) and Adam Thielen (all the others). After that, the receiver position bounced around a lot more … though with all big names. Jones famously went Weeks 1-8 without any touchdowns in 2018 despite a league-leading 116.0 receiving yards per game. He became a meme and everything. And then from Week 9 to the end of the season, Jones had 8 touchdowns … or the most in the league. Jones might not be the touchdown magnet that a vintage Dez Bryant was, but the “never Julio” sentiment was always misguided. In this particular four-week stretch, he topped 100 receiving yards four times and averaged 7.8 receptions and 11 targets per game. Through Week 9, Allen sat at only 19th in PPR scoring among receivers. Through Week 13, he was eighth. Sound familiar? Through Week 10 of 2017, he was 26th at the position. And then through Week 14, he was third. I’m not saying that Allen is definitely a second-half performer by any means, because that could just as easily be a fluke as anything. But if he’s on the trading block in midseason of 2019 after a disappointing first half, I’m at least thinking about it. Cooper’s five-week stretch here is notable for being the Nos. 1 and 2 four-week stretches in PPR points for any receivers all season. Relatedly notable: No matter which four-game stretch you opt for in the sample here, it includes a game with under 40 yards, as Cooper had a 36-yard Week 11 and a 32-yard Week 15. On top of that, he had a scoreless 76 yards in Week 13. Really, it was Week 12 (180 yards and 2 TDs) and Week 14 (217 yards and 3 TDs) that carried Cooper to the crown. If he can be anything like that in 2019, he’s a premier best ball option. Really, it was the season of Zach Ertz and Travis Kelce, as the two combined to lead every four-game stretch in 2018 except for the first and the last (Ertz five, Kelce seven). There’s only so much to be said about those two, so we’ll focus on the other two leaders. In what I’m sure is shocking news, Kelce and Ertz were Nos. 2 and 3 over the season’s first month. But it was Cook (the other most surprising name to make this list in 2018, along with Josh Allen) who led the way. Even with only two touchdowns in the four weeks, it was more than he had in any full season since 2014. 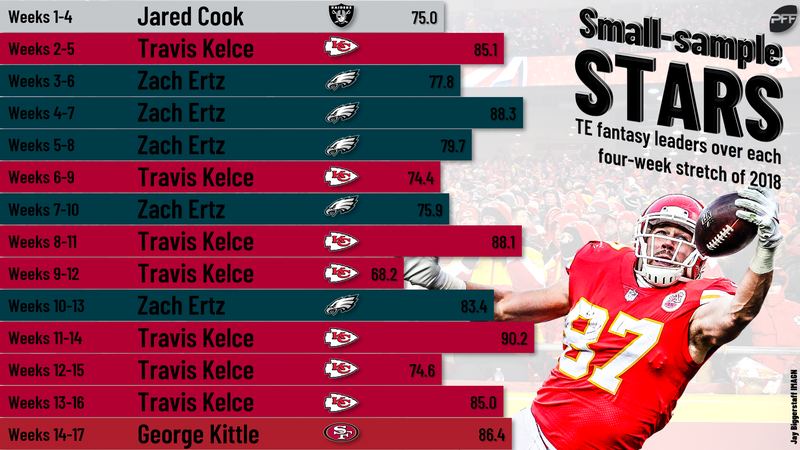 From Week 4 forward, Cook was actually a distant sixth at an awful position in fantasy scoring, behind Austin Hooper. It was still a fine season overall, but Weeks 1-4 made it look better than it was over the full year. Now with New Orleans, Cook has a sky-high ceiling, but it’s worth nothing that he’s a decade into a career that was almost uniformly disappointing before the start of 2018. Kittle sat 14 points behind Eric Ebron through Week 13, in fourth place at the position, then outscored the Colts tight end by 46 points over the season’s last month, cementing his place in the position’s top tier. This stretch for Kittle included his 210-yard eruption against the Broncos in Week 14 and his “gotta break the TE receiving record” 149-yard performance in Week 17. He’s pretty solidly the No. 3 tight end for 2019, with a better argument for bumping him up to No. 2 than bumping him down to No. 4.